Poetry, as I explained to the class, was never a real thing for me, as a schoolkid. For us, poets didn’t exist. They lived only in dusty books on that shelf of the library that nobody could reach. So, to have a real, breathing specimen standing before them today was a treat, I beamed. They didn’t seem so sure. At least, not at first. Activities Week. The one week at the end of the year when all pupils in the school at which I teach are taken off timetable and sign up to a variety of events, trips and workshops that they wouldn’t get the chance to the rest of the academic year. A window of creativity in the gloom of the exam factory. At least, that’s how it’s meant to be seen. Many of the kids in front of us on that rainy morning last week hadn’t signed up to this. The computer games room was full. The football club was full. Even the board games activity was over-subscribed. So, apart from a few rare species that actually signed up to a week of art and poetry, the majority of pupils before us were added to the list as they simply had nowhere else to go. And so they found themselves enrolled in a week of poetry and art activities. Hm. This could go either way. 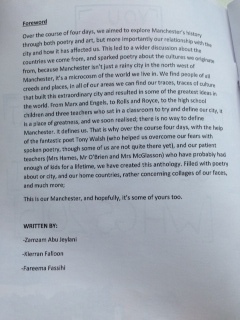 Luckily for us, we had enlisted local poet Tony Walsh a.k.a. Longfella (a pseudonym attributed to his towering 6′ 5″) and within seconds he had them hooked. We had booked him in for the day to help the pupils create some poetry of their own. The theme of the whole project was ‘Manchester’ and our relationship with the city. Our school is within a couple of miles from the city centre and we wanted the pupils to explore their identity, express how they feel about Manchester through art. Some of our pupils are Manchester-born, many others from other parts of the world, from Iran and Pakistan, from Somalia and Palestine. Our city is the thing that binds us, and we wanted to explore those links. Project-based learning allows pupils to explore things in depth. In any normal school day pupils are thrown around a carousel of classrooms, one minute they are in a science lab the next they are in a sports hall, so there’s little wonder that by the time they reach my classroom, especially in the afternoon, their attention levels can be somewhat lacking. No matter how I frantically try to plunge them into the worlds of Dickens or Shakespeare, get them excited about semi-colons or even keep them awake long enough to work out what a subordinate clause is, the odds are often stacked against us. Sometimes, you can only skim the surface (within that 50 minute slot) before the bell goes. So, to have a full week in an art studio to explore poetry and art, to me, was a blessing. To the kids, it was potentially a nightmare. Though Tony soon put them at ease. He had them up, out of their seats, moving around the room for a few warm up activities and before they knew it, they were writing. No fuss, no mither, no ‘please, sir, can I go to the toilets til this is over,’ they wanted to write. 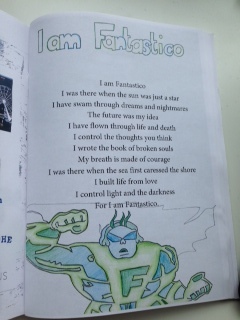 Within minutes we had a crafted a group poem, a fantasy piece , ‘I Am Fantastico’, in which we collectively invented a mythical character. Within minutes. Reading it back, you could see the pupils warming to this idea – we had created something. A character, a poem, a work of art. Five minutes ago it didn’t exist, and now it does. That slow realisation that it doesn’t matter if you’re in the bottom set for English (or the top set), everyone can create. And so it went from there. Tony explored the city of Manchester with them without leaving the room. Through discussions and video-clips, poems and anecdotes, a patchwork formed of smoky industrial landscapes, chimneys and rooftops, of suffragettes and inventors, architecture, football and politics. The pupils were learning about their city, exploring and sharing their identities. Tony interspersed his anecdotes of Manchester with poetry – reading his own work aloud and showing clips of other local poets. This took poetry from the page, made it real. 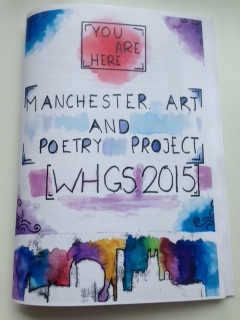 The pupils could see the poetry, access it, feel it. And it struck me – of course, all those times in class when I’d tried to introduce kids to poetry, trying to drag them across fields of Wordsworth’s daffodils, they had to first feel it, to see it, to believe it. Otherwise it’s part of something else. Part of academia. That world of dusty books and universities that they can only dream of being a part of. Elitist. Here, as they heard a real poet read his poetry or watch footage of local kids receive roars of applause at slam-poetry events, they could taste it. It’s like playing football for the first time after only ever watching old matches on VHS of long-dead players you are told are great. Suddenly, it’s a real thing. It sounds cliche, but the pupils really did go on a journey that day. We had some kids who were previously that shy that they struggled to speak up to answer the register now confident enough to read their own poetry aloud to the group. We had pupils who had recently been removed from classes for repeated poor behaviour now focused, keen, writing. Taking pride in their work. Channeling their anger, their frustrations, their energy onto the page. Simply because they had the time to do it, in depth. By the end of the day, we had a collection of poems. The rest of the week we dedicated to creating artwork to support it. It was great as an English teacher to work alongside an art specialist. Normally, in class, pupils would write in their books and that would be it. Some pieces might wind their way onto a display board in my classroom, but many would remain trapped in a pile of exercise books in a cupboard. So, we set about creating artwork that would take pride of place alongside the poems in an exhibition and in a printed anthology. 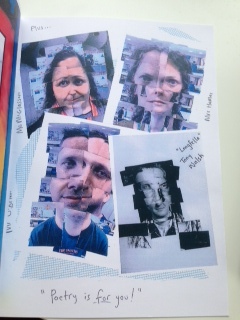 We further explored the theme of identity, pupils taking pictures of each other and creating David Hockney style joiners with them, collages that distorted and reshaped their faces, playing around with their image. We took maps of the city and ripped them, distorted them, reshaped them, took images of the city’s architecture and played around them, creating new thing from familiar buildings. It was learning, but in a completely creative way. The pupils were exploring their identity, their heritage, their surroundings, but all the time creating new things, splicing flags of countries from all around the world with maps of the streets they now lived. The most rewarding part of the week for me was on the final day, when pupils got to showcase their work. In a hall, in front of dozens of other students, they were invited to perform their poetry. Never, I thought. Some of these kids find it difficult enough to speak to each other, never mind perform poetry. But they did. And they did it well. With images of their artwork behind them, they read odes to the city they live in, elegies for lost childhoods, rants against bullying, stinging protests against war and stereotyping. And the crowd loved it. So, if you want pupils to access poetry, to explore their identity or just to grow in confidence, project-based learning can be massively rewarding, for staff and students. I’ll definitely be doing it again. One of the great things about this week for me was working with the kids. Having the time to sit next to them and write my own poetry, show them, laugh at my bad lines and half-rhymes, create my own artwork, so they see it as something active, something developing. Importantly, I showed them my mistakes. 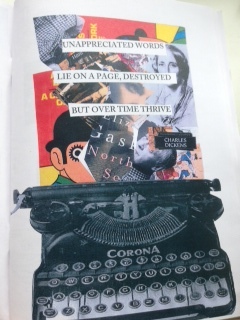 We laughed at my horrific attempt at collage before they showed me how to put it right. And for once, the battle lines of ‘them and us’ came down, no impending school bell to hurtle them into Physics or Maths, time to shape something, including staff-pupil relationships. These things take time. Foreword, hastily written by some Year 10 pupils. 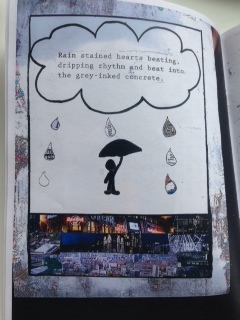 An example of one of the amazing haikus the pupils came up with. I am Fantastico! Group poem. 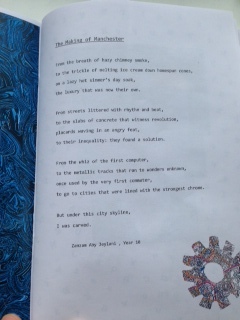 Just one of the many great poems we collated. Poem I wrote alongside the pupils. If you are looking for a poet to ignite some minds, I would heartily recommend looking up Tony Walsh (@LongfellaPoet) http://longfella.co.uk/ What a legend! He has disarming way with pupils. They instantly look up to him (well, it’s hard not to when you’re 6’5″). He gets great results through his enthusiasm and expertise. He literally passed the baton of the pen to our kids, leaving one shy lad in particular with the pen a poet once gave to him! Who knows, maybe he’ll be doing the same one day. 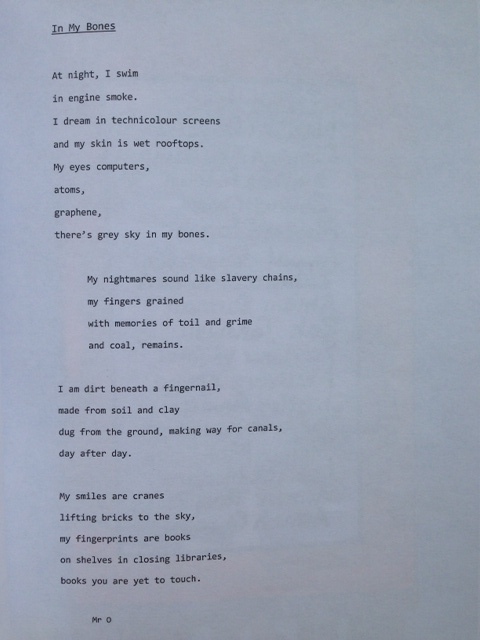 This entry was posted in Thoughts, Words and tagged Art, creative writing, creativity, Education, longfella, manchester, pedagogy, poetry, project based learning, teaching poetry. Bookmark the permalink.